This "Historically Speaking" column appeared in the Exeter News-Letter on Friday, September 30, 2017. In the collections of the Exeter Historical Society there is a file labeled “Famous People Visit Exeter.” Most of the photos in the file are politicians, but nestled amid Gerald Ford, John F. Kennedy and Dwight Eisenhower is an old photo. 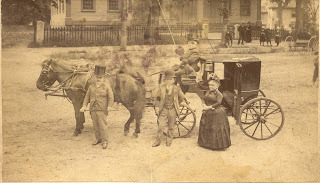 In it, a distinguished group of people are posed in front of their carriage with the Congregational Church looming behind them. Someone attempted to label the photo on the front, but the handwriting is difficult to read. Just who were these people, and why does the photo look somehow - - off? Thankfully, items donated to the society are logged into our record books. 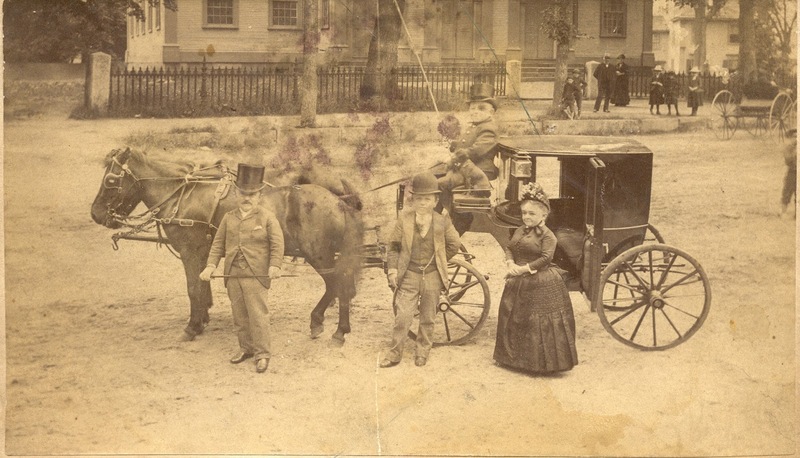 The photo was given to us in 1976 by Harriet Rose, who described it as, “Tom Thumb and party in front of the Congregational Church.” There is a note on the back of the photo that says “Frances Lawrence” with no further explanation. General Tom Thumb was the stage name of Charles Stratton, who was born in Bridgeport, Connecticut in 1838. He was a big baby at birth, but at six months had ceased to grow. A chance meeting with P.T. Barnum, another Connecticut native, in 1842, brought the boy opportunity that exceeded anything his parents had hoped. Barnum was the nation’s premier freak show promoter. When he met the four-year-old Stratton he knew he could make the boy famous. Charles was taken to live in Barnum’s museum, given the stage name “General Tom Thumb” and began touring the country with Barnum. He surprised everyone by being able to remember long scripts as his act called for him to dress up in costumes and recite. He and Barnum formed a long and warm friendship. As Tom Thumb, he visited Exeter in 1848 when he was 10 years old. Just back from two European tours, the Exeter News-Letter posted a notice – most likely a pre-written press release – that gushed, “The General has been a great traveler, and brings news from all regions with him. 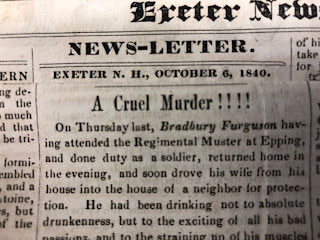 He has visited the Courts of Europe and been on terms of great familiarity with the highest.” The University of Connecticut’s archives contain a broadside advertising the event in Exeter. “MAN IN MINIATURE – ONLY 15 POUNDS!” it declares. “16 YEARS OLD AND BUT 28 INCHES TALL!” In truth, Charles was much younger than 16 and his height was 29 inches. He would grow a few more inches as he matured, but he never topped three feet. In any case, our photo is not of this trip to Exeter. The group in our photo contains only adults. At the age of 24, Charles met Lavinia Warren at Barnum’s museum in New York City. Also a little person, Lavinia had been born in Middleboro, Massachusetts. 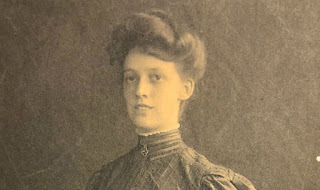 She’d trained as a teacher and was happily teaching primary school when a cousin convinced her to join a showboat troupe and travel through the South. She returned home after the outbreak of the Civil War and was working in New York for P.T.Barnum when she met Charles. The two were instantly smitten and their wedding, held at Grace Church on Broadway was followed by the national press. Staged photos of the event were available everywhere. In spite of the carnival like atmosphere, the marriage was legit. The two began touring almost immediately. They built themselves a fine house in Lavinia’s hometown of Middleboro. The interior was adapted to their small stature. Life seemed to be going well – they were famous and wealthy. At one point, after Barnum had made some bad business decisions, Stratton bailed out his friend and they became partners. Sadly, even though he’d figured on a long life, Charles Stratton died of a stroke in 1883 at the age of 45. Lavinia was left without much of an income. She could have been thrifty and lived off their savings, but at 44 she was unwilling to slide into retirement. Photo: from the archives of the Exeter Historical Society, depicts some very famous and accomplished performers who were in town in 1889. You can see the Exeter Congregational Church behind the group.